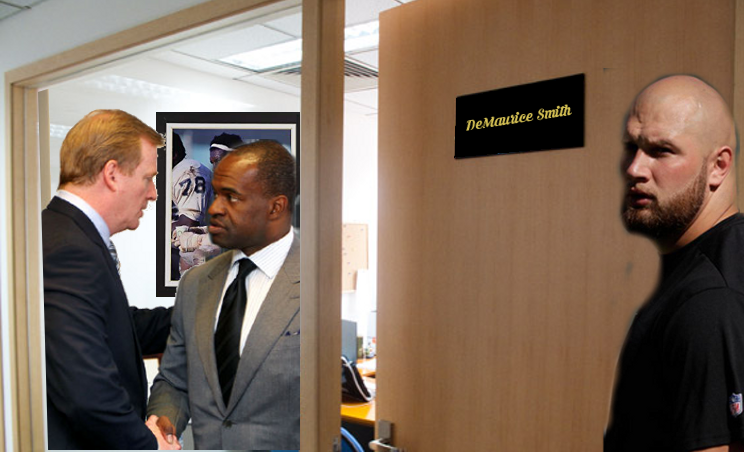 Will He Get the Discovery He Seeks or will NFLPA Succeed in Making Things Go Away? In a previous article I wrote, “The NFL and NFLPA are natural adversaries. Will the NFL become an ally to Johnson in the vein of “the enemy of your enemy is your friend” or will they assume an adversarial position against both Johnson and the union? Or will they ally themselves with their usual adversary to cover potential misdeeds of collaboration or collusion with the NFLPA?” It didn’t take long to get an answer. 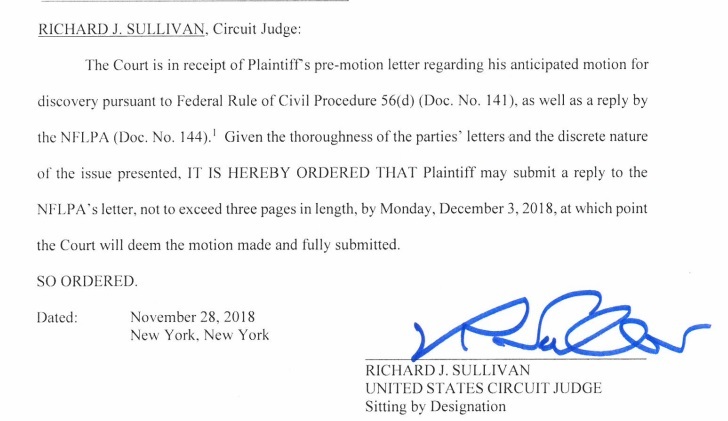 Both the NFL and NFLPA responded to Lane Johnson’s request for discovery and Judge Richard Sullivan’s order regarding the same, with a resounding “No!” It’s less than surprising they decided to choose the third option and unite against Johnson, who stands to reveal their alleged back-door collaboration. 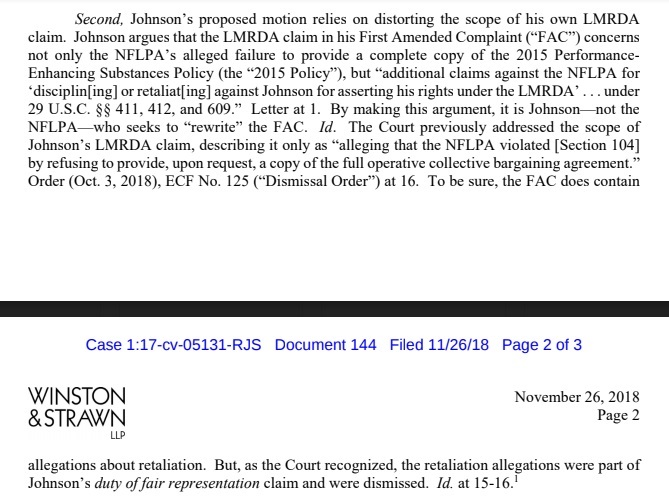 Nash continued, “Although Johnson’s LMRDA claims are asserted against the NFLPA and not the NFL Defendants, the NFL Defendants nevertheless oppose Johnson’s request for discovery, as well as the scope of his intended discovery.” The letter seeks to spin Johnson’s recovery request into “a backdoor attempt to re-open the underlying arbitration,” when in fact it’s their own backdoor Johnson wishes to open. “Johnson’s request is yet another attempt to gain discovery that was already denied by the arbitrator,” writes Nash, citing Deflategate precedent as to why the arbitrator was within his right to do so. There’s one major flaw with the NFL’s argument. Johnson is not seeking to pursue his LMRA claim or have his arbitration overturned. The court, as a finding of fact, concluded that the NFLPA did not grant Johnson access to the materials due a union member and this is the issue Johnson is focused on. True to his word, he did not object to the NFL’s motion to dismiss and slight overkill in a supporting memorandum of law in respect to Defendant NFL’s dismissal from the case. His only opposition was to their request to dismiss his entire complaint and the misconduct of the union. The NFLPA wishes to evade discovery at all costs, it seems. “Specifically, the Court found that ‘discovery is not appropriate’ because Johnson’s remaining LMRDA claim ‘turns on the question of whether the NFLPA’s October 16 document production has mooted the claim.’ Order (Oct. 23, 2018), ECF No. 131 (“October 23 Order”) at 1. This should be the end of the matter.” According to Johnson the NFLPA has produced some documents. As I stated in an earlier article, they seemed to have called all the king’s horses and all the king’s men” to ensure Johnson’s discovery bid doesn’t prevail. The documents provided were overkill. But they didn’t satisfy Johnson’s request for documentation of the “back-door” secret deals Johnson accuses them of. Deals that apparently took place if one accepts their statements regarding deviations from the CBA that Johnson is entitled to. NFLPA insists that their withholding of documents has nothing to do with his retaliation claims. It’s unclear how Judge Sullivan will view the argument, but common sense has to ask why the NFLPA found withholding documents for the entirety of Johnson’s LMRA claim appropriate. The court concluded that nothing NFLPA might provide would have changed the outcome of the arbitration. If this is true, what reason would the NFLPA have for unlawfully withholding these documents? The only reasons that come to mind are retaliation, or a cover-up NFLPA doesn’t want revealed. The NFLPA clearly wishes to evade these questions. The NFLPA also presents another argument regarding damages that doesn’t have clear precedent. If the court should view Johnson’s LMRDA claim from a damages or injury perspective, this could be troublesome for Johnson. His obvious injuries were tied to the LMRA claim, seeking to overturn his suspension, which of course, involved monetary damage in the way of lost wages. Courts have often viewed injuries monetarily, dismissing less tangible forms of injury. Johnson is also asking for additional damages with some case law to support. It’s unclear how Judge Sullivan will view the arguments. Sullivan concluded that “Johnson has not plausibly alleged that any of this conduct was both ‘arbitrary, discriminatory, or in bad faith’ and that it ‘seriously undermined the arbitral process.’” The word “and” could be a major component in Johnson’s case moving forward. Sullivan found the union’s deviations and side deals to “plausibly fall ‘within the realm of being ‘necessary to the orderly implementation and administration’ of the Policy.” Sullivan also concluded that the union’s failure to investigate falls short because the lack of investigation wouldn’t have influenced the arbitral outcome since policy states that a player is responsible for whatever he ingests regardless of the circumstances and Johnson has not presented any evidence to support the finding of a banned substance in his urine sample was wrong. Sullivan also relied on the fact that Johnson hired his own counsel and wasn’t therefore dependent on the union to investigate his claims. Ehrlich finds this problematic, and indeed it is if you happen to be the union member at odds with union management. The underlined portion is critical to Johnson’s case. Johnson has factually proven that side deals have indeed been undertaken. Will Judge Sullivan view this as removal of “contractual avenues of review for grievances at the Union’s whim?” This isn’t clear. While Sullivan has confirmed that Johnson is correct that side agreements have been undertaken, he seems to view them more in the vein of ‘orderly implementation and administration’ than ‘whim.’ He also noted that the deviations resulting from the side deals impact all union members, and not just Johnson. 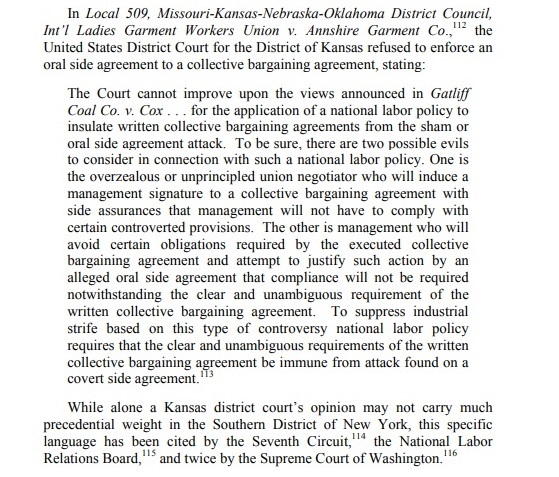 In viewing Rupcich, however, the union’s side agreement obviously impacts more members than just the plaintiff. Can this be leveraged to Johnson’s advantage? Ehrlich points out what may turn out to be an important detail. In a similar case, Mike Pennel, another NFL player, was represented by Steve Zashin, Johnson’s attorney. In a hearing before Judge John Adams, Zashin made clear that side agreements regarding drug policy have never been provided to players. The modifications involved in Pennel’s lawsuit shadow those of Johnson’s litigation. At the hearing, NFLPA attorney David Greenspan defended the modifications claiming mutual consent between the NFL and NFLPA but couldn’t answer if the modification was written or oral, nor did he know if it was raised to the board of player representatives, which would be mandatory for revision of a CBA bargained policy. Judge Adams found this troubling. Ehrlich points out additional precedent that could be favorable to Johnson. 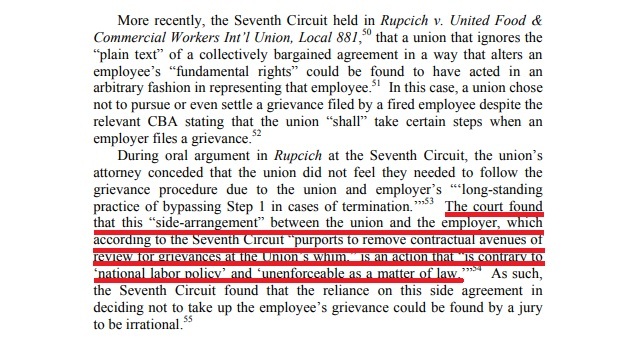 In taking the long road to make a point, this appears to be the damages hinge in Johnson’s case—a fundamental violation to rights of rank and file union members, including himself. Will it be enough? It’s difficult to make a call as to how Judge Sullivan will view the argument. Zashin pointed out in his letter to the court that a ruling for the NFLPA would set precedent encouraging union misconduct. To date, despite all the superfluous documents the NFLPA has provided in attempt to shut down Johnson’s discovery request, “Johnson has never received the Collection Procedures and he is entitled to take discovery on whether they exist and whether the NFLPA continues to withhold them from him,” Zashin argues. It seems the only way to determine if the agreement was verbal or written and the circumstances surrounding it is to obtain discovery and ascertain the origin of the deviation once and for all, and why this information is still withheld from Johnson. While as Zashin admits, compensatory claims have been diminished, he cites case law in which a plaintiff prevailed on an LMRDA claim where compensatory damages awarded were only $1.00 for nominal damages. Punitive damages would be asserted to punish the union and discourage future bad behavior. Zashin states that when a plaintiff prevails on an LMRDA claim, attorney fees are typically awarded him. On November 28, Judge Sullivan issued an order soliciting a response from Johnson by December 3. It’s difficult to predict the outcome. Johnson has some important and valid complaints. Judge Sullivan is a conservative judge with a typically pro-management view of labor issues which doesn’t help Johnson but doesn’t extinguish the possibility that Sullivan will see the importance and validity of Johnson’s requests. He did, after all, confirm that Johnson does have a valid LMRDA dispute and is entitled to all relevant documents amending or supplementing his CBA. Richard Sullivan was recently appointed to the Second Circuit Court of Appeals by Donald Trump and is now sitting by designation at the Southern District of New York. It’s unclear if he will retain jurisdiction of the cases he’s currently presiding over, including Johnson’s, or if at some point they will be transferred to another judge. For now, there are more questions than answers. My thoughts are expressed in this tweet. I’ll leave things there.